Rarely (if ever) does the size of a quilt batting perfectly coincide with the size of your quilt top. There are always trimmings and irregular-sized pieces left over. And... the frugal and efficient makers that we are... we save them. Right? Using Heat Press to fuse batting scraps together. If you're not making a lot of little projects—mug rugs, zippered pouches, soft books, and such—you probably have a "collection" of these miscellaneous chunks... too big to throw away but not quite big enough for a current need. I posted two methods for joining batting pieces together: by machine in this post, and by hand in this post. 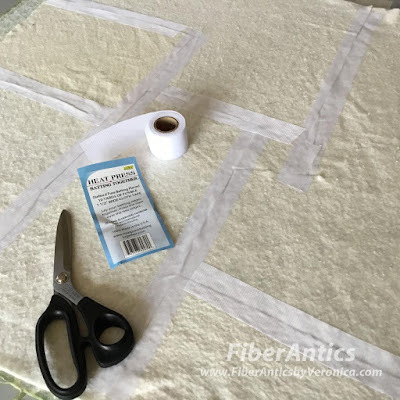 But here is a great product for piecing batting scraps together—using an iron. It's called "Heat Press." 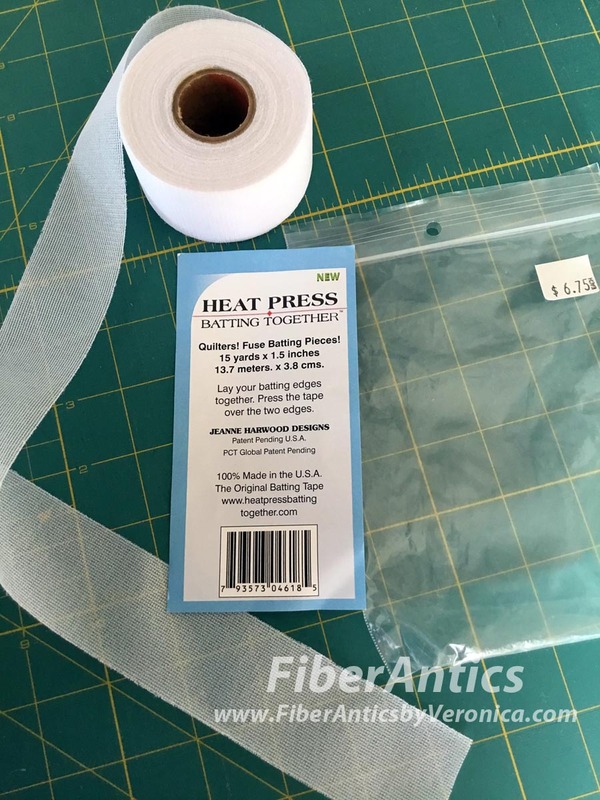 Heat Press is 1.5" wide and is packaged in a roll. *The package instructions recommend different heat settings depending on the fiber content of the batting and whether your iron has a teflon plate or not. Be sure to read this so you don't melt the fusible or damage the batting. The Heat Press website is chock full of helpful information: video demos, tips and information about related products such as an Appliqué Tape and (OMGosh) a "Stretchy Hem Tape" for working with knits that comes in white and black! Anyone tried this stuff? These products were invented by Jeanne Harwood, a quilter, garment sewer, instructor and consultant to apparel manufacturers. The products are 100% Made in the USA and can be purchased through the Heat Press website or ask for them at YLQS [your local quilt shop]. Got batting scraps? Use 'em and fuse 'em for your next project.